Did you know the Martlet has begun hosting workshops? Typically held on the bi-weekly Tuesday evenings that we don’t have copy-editing (though we can be flexible on the day), these workshops are an awesome place to learn, network, and share knowledge and stories with fellow journalists, students, and professionals! Our workshops can range from simple, question-and-answer sessions with professionals in the field of journalism and beyond, to more intricate workshops with interactive components. 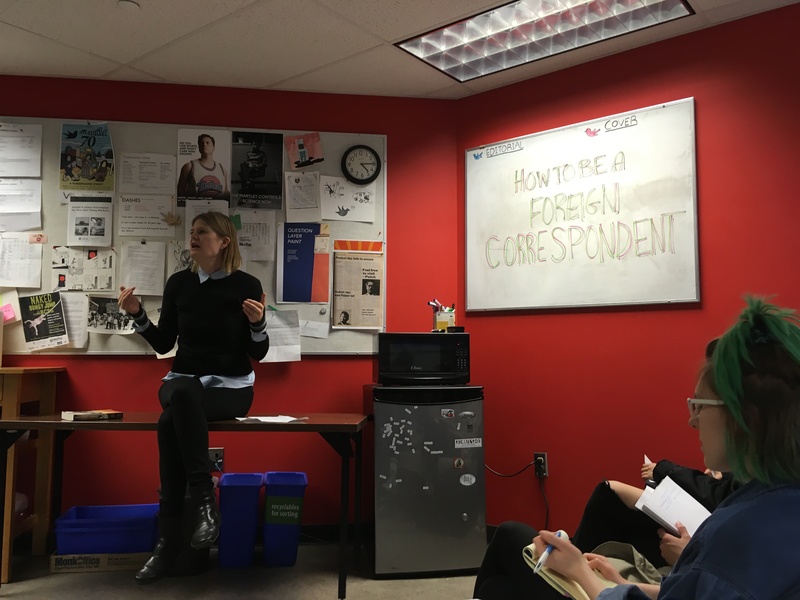 In 2018-2019, the Martlet hosted five workshops: Introduction to Photojournalism, Social Media Marketing, How to Be a Foreign Correspondent, The Freaky World of Freelance, and How to Survive and Thrive as a New Journalist. If you’re interested in attending our workshops, stay updated on this page for information on upcoming and past workshops. In addition, our Facebook page will be updated when a workshop is decided upon, and we’ll remind our readers on Instagram and Twitter as well. If you’re interested in hosting a workshop yourself, please email our Editor-in-Chief, and make sure to peruse below for an idea of what workshops look like (pretty casual) and some of the handouts that have been included in the past. If you missed a workshop and you want the handout, check out the links below! The Martlet is always happy to work with journalism or creative writing classes. 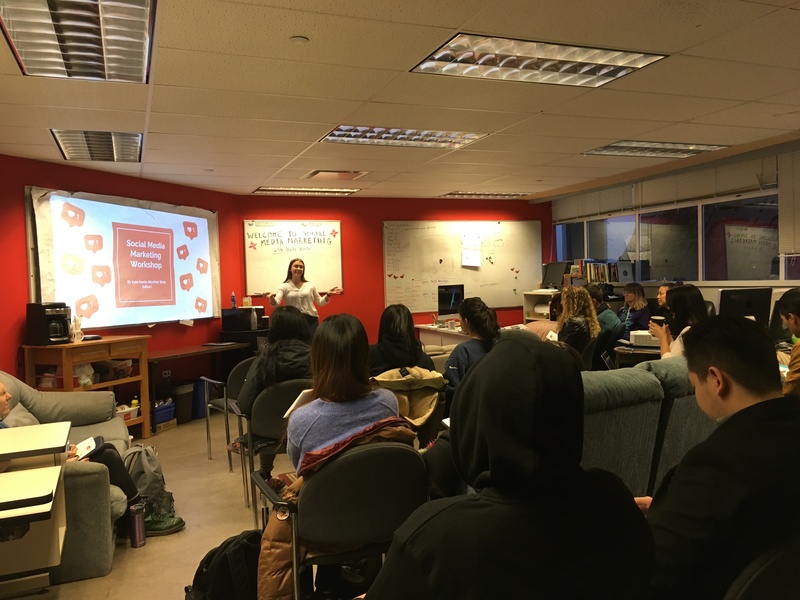 In the past, classes have come to the Martlet newsroom and our Editor-in-Chief or other editors have spoken to the class about getting involved with the Martlet, how to pitch to a publication, and how to write news or culture pieces. We’re also open to visiting classes at the university and high schools in the community. In 2019, two Martlet editors visited a Grade 11/12 Creative Writing class to talk about writing music reviews for a publication. Check out the link below for that handout, too! Web Editor Kate Korte presents on the intricacies of social media marketing in the world of journalism and beyond. 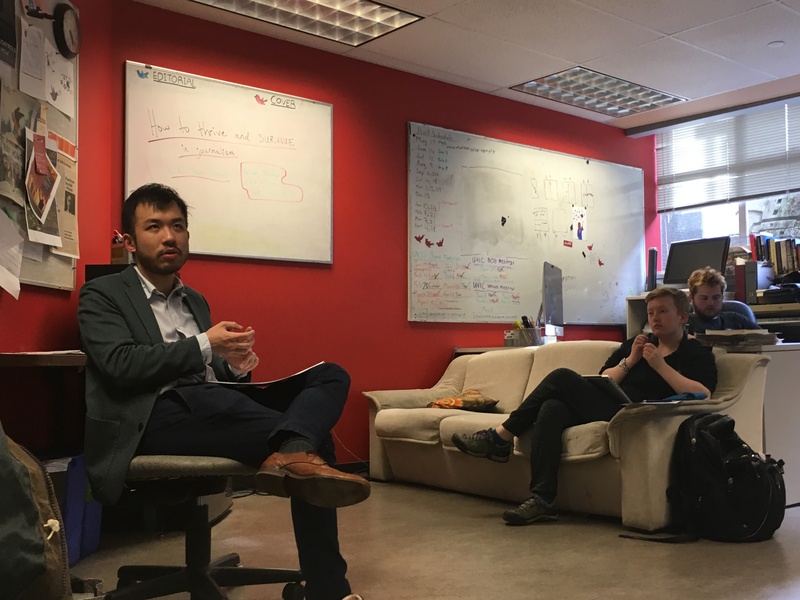 Former Martlet Editor-in-Chief and local reporter Hugo Wong presents on the journalism scene in Victoria, and how to survive and thrive in the industry locally and nationally. UVic professor, author, reporter, and foreign correspondent Deborah Campbell presents on her experiences as a foreign correspondent in Iran, Cuba, Syria, and Dubai — among other locations.